Issued 2014. 10". 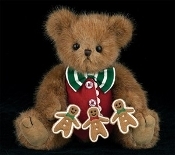 See also his friends Ginnie Gingersnap 173206, Jimmy Gingersnap 173205 and 3 1/2" Gingerbread cookies 1762b (boy) and 1762g(girl).